For the tea drinkers in your life, buying them the complete no drip teapot with infuser set is a great gift idea. Whether as a housewarming gift, birthday gift or special occasion gift, it is a cherished useful gift that would certainly be put to good use. A good teapot is one that does not drip, easy to pour and has a handle that stays cool to the touch. It’s also a teapot that does not spill boiling water all over the stove (if suitable for stove top use). If you love to steep your tea, then the dripless teapot with infuser or strainer works best. It makes steeping your tea simple and hassle-free. A teapot with infuser or strainer helps keep the tea leaves from being poured out into your cup of delicious tea. There is also no blockage at the entrance to the spout. The tea pours out smoothly. The loose leaf tea infuser pot is a great way to brew a pot of loose tea. 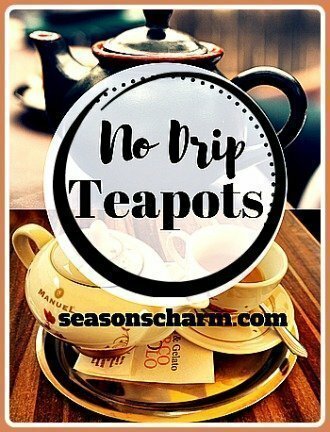 A non-drip teapot doesn’t cause tea stains on your tablecloth or countertop. These teapots do not drip due to their innovative spouts. Teapots come in many different types of materials. You get the glass tea infuser pot, the famous durable Yixing teapots that can enhance the flavor and aroma of tea, ceramic teapots, Japanese cast iron teapots, stoneware teapots, stainless steel teapots etc. The glass teapot is great when brewing blooming teas as you get to watch the flowers unfurl as they brew. You can also consider the electric teapot with infuser as a gift for your tea drinking friend. Boiling water using an electric kettle with tea temperature setting buttons make it super easy to steep your tea in the best temperature recommended for that particular type of tea. The NutriChef electric tea kettle steeper comes with tea infusing basket for brewing your green tea, white tea, oolong tea, black tea. 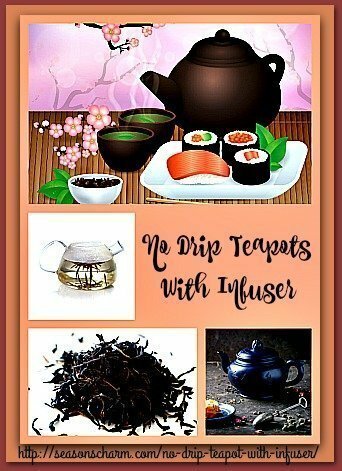 If you are buying a small teapot with infuser gift set, here are some lovely choices I came across while searching online. These can make 2 -3 cups of tea. For the larger teapots, you can get 4 – 8 cups of tea depending on the size of your cup. 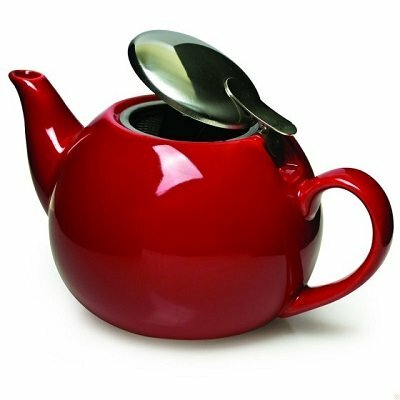 This lovely curve red ceramic teapot with stainless steel lid and a fine mesh stainless-steel tea infuser. The lid comes fitted with silicone gasket that secures the lid firmly while pouring. You can steep whole loose tea leaves or teabags with or without the infuser. It can hold about 3 nos. of 8 oz cups of tea. Both the 24 oz ceramic teapot and infuser are dishwasher safe. This 40 oz (about 5 cups) ultra clear hand blown glass teapot with removable infuser is made of heat resistant BPA free borosilicate glass. It comes with a removable glass infuser for steeping your loose tea and tea bags. The Primula flowering tea gift set includes a canister of 12 different flowering green teas made by artisans, glass teapot, lid and loose tea infuser along with easy brew and care instructions. It is safe for stove top use. This non drip glass teapot with infuser makes it easy to observe your tea brewing process. Remove the infuser when brewing the blooming or flowering teas. Watching the fascinating magical opening or blooming of the flower sure gives me such a lovely feeling. Yes, for steeping flowering teas, you do need a glass teapot to totally enjoy the whole tea steeping and drinking experience. This is a glass teapot with infuser and warmer set. 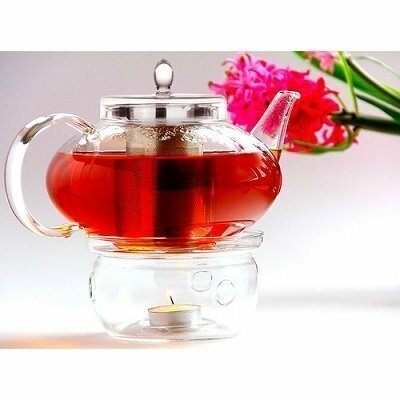 Made of lead free glass that can withstand temperature shock, this 42 oz mouth blown glass teapot cannot be used directly on top of stove top. The mouth blown teapot warmer is also made of the same special lead free glass. A metal rack as well as a tea candle light is also included in the whole set. The warmer is a great way to keep the pot of tea warm but not boiling hot. The infuser is made of stainless steel. The glass lid fits perfectly on the teapot even when the infuser is removed. It comes with a non drip spout. You can wash it in the dishwasher top rack but it is not microwave safe. 20% recycled glass is used in the making of the teapot and warmer. 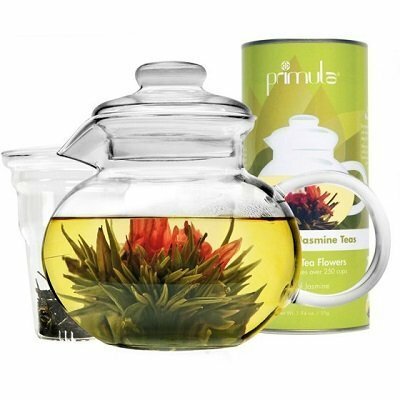 The glass teapot with infuser is great for brewing flowering tea (buy separately) as you get to watch the flowers ‘bloom’. An elegant tea gift set for tea lovers, this Glass Teapot Harmony, 42oz/1242ml with Tea Warmer Cozy Lead Free Special Glass No Drip by Tea Beyond makes the perfect housewarming gift for new home owners who love their cup of tea. This is a made in Japan iron teapot with a 22 oz capacity (about 2 – 4 cups). The interior comes with enamel coating to prevent rust. A removable stainless steel infuser is included and this is great when brewing your loose leaf tea. Even though the pouring spout seems short, it is drip free. This tetsubin iron teapot is not meant for stove top use. A quality durable and beautiful oriental teapot, this would make an excellent gift for tea lovers and teapot collectors. You can also get the cast iron teapot with cups set. 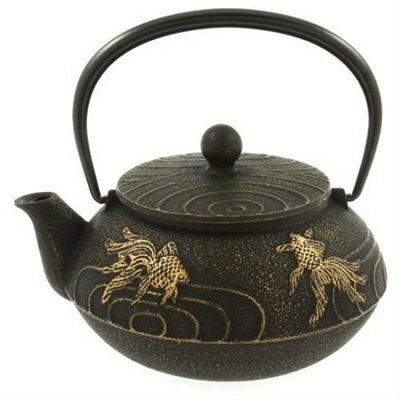 You can check out this other more affordable 24 oz capacity cast iron teapot that follows the classic Japanese style. It comes with a stainless steel basket for brewing loose leaf tea. The teapot is made of 18/10 mirror finished stainless steel and has a micro-etched removable stainless steel infuser basket with a built-in tea leaf guard. There is no filter at the spout opening. Stylish and elegant with its beautiful mirror finished design, it would make an excellent elegant tea gift. This stainless steel teapot has a drip-free spout and a long comfortable handle for easy pouring. 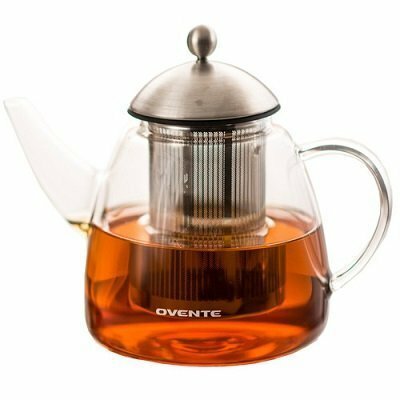 The elegant Ovente teapot weighing only 0.83 pounds, is made of durable and stain resistant high borosilicate glass. The 61 oz ( about 8 cups of tea) capacity glass teapot with infuser is their largest size. You can also get it in the smaller 44 oz capacity teapot. It has an overall height of 6.25″ (from top to bottom). This drip free teapot with a heart flower shaped glass base warmer, has a large stainless steel infuser attached under the stainless steel lid. The flower shaped warmer is included with the teapot set. It is not meant for stove top use. This chili red 20 oz ceramic teapot with infuser comes with a hinged stainless steel lid and a dripless spout. 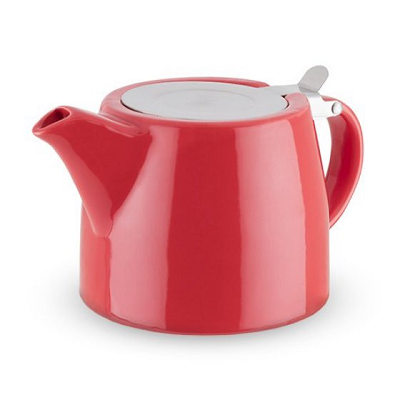 The bright red ceramic teapot will certainly brighten up your kitchen table. Anti drip glass teapot with a stainless steel infuser/filter makes it perfect for brewing a pot of blooming tea. Cool features include a drip-free spout and an ergonomic handle. Made in France, this 16 oz round glass teapot measures about 5.5″ in diameter x 4.7″ H.
It is not recommended for microwave or dishwasher use. This is a very zen teapot complete with a bamboo handle and a raised bamboo trivet or stand. It is made of 20% recycled borosilicate glass material. 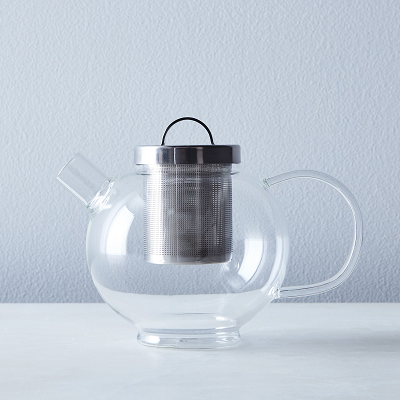 The hand blown borosilicate glass teapot set comes with an inner glass filter for steeping loose teas. There are no spills when pouring out the tea. 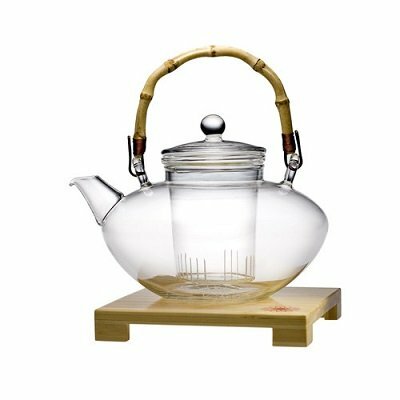 What a relaxing way to serve tea to your guests with this glass teapot with bamboo handle – so Asian so Zen. The no drip teapot with infuser gift set will certainly be cherished by tea lover friends. Tea drinking seems more special, more zen, more relaxing when served in a lovely teapot.